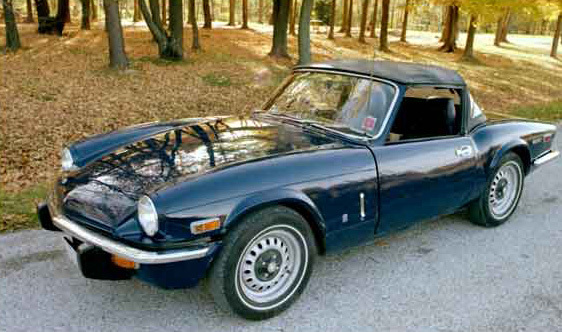 I originally purchased this ’71 Spitfire IV in 1980 while in college. I had to borrow $1000 from my Dad who thought it best that I get a sports car and not a motorcycle. We both believed my mother would have killed me if I’d bought a bike. A midnight blue Spitfire wasn’t a big hit with Mom, however it was a blast to drive. My favorite memory is my first date with Roseann. The prettiest girl I've ever met. I picked her up in the Spitfire after she got off work from the local Walgreen's. We drove to a bar where I quickly learn she was not of legal drinking age. Busted. Not easily deterred I took her to a nice restaurant where we had pizza and pop (that’s what Midwesterners’ call soda). Before driving her home we sat in the Spitfire under the moonlit night parked across the street with the headlights shining on the Victorian house I grew up in. We talk (really just talked) until 2 AM. A year later, on the first anniversary of our first date we got engaged. A year later we got married. Married 28 years we now have six children and six grandchildren. And it all started with a date in a little blue Spitfire which today sits in our garage waiting for me to finish the restoration and get her back on the road again.